There was too much stress on my extruder wire at the motor connector and the blue wire broke. 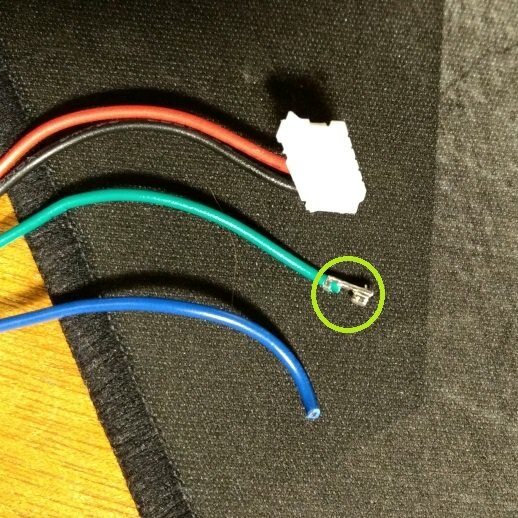 I have a crimping tool, but I'm having trouble figuring out what this connector is called. I have 2.54mm pitch connectors for the end of the cable that goes to the controller, but they are too large for the housing that goes to the motor. Anyone know what it is called or suggestions on how to figure it out? Thank you! Edited 1 time(s). Last edit at 03/18/2018 08:46AM by fullHundo. If it mates with a connector on a stepper motor, it's probably a 6-pin JST 2.0 connector. Crimping the pins on those connectors is tricky. It's probably easier for you to buy a new motor lead. You can get motor leads from E3D, Robotdigg and elsewhere. Check that the order of the colours is the same at the motor end as your existing cable, because there are at least two different pin orderings used by stepper motor manufacturers. Or you can get a pre-wired 6-pin JST 2.0 connector on eBay and connect it to your existing leads. Thank you for the info. This wire is for my e3d Titan extruder which does use a different pin ordering from my generic extruder. I will look into purchasing some new leads and maybe some 2.0 connectors just for practice. In the meantime, I was able to reorder the pins from my generic extruder wire to match e3d to keep printing. Thanks again!